To celebrate the happiest time of the year (the beginning of school), I am going to give away a few books on Reading Acts. Two weeks ago, I gave Jake Bodet a copy of The World of the New Testament: Cultural, Social, and Historical Contexts (Grand Rapids. Mich.: Baker Academic, 2013) edited by Joel B. Green and Lee Martin McDonald. Last week I gave James Gray a new copy of Reading Luke (Zondervan, 2005). 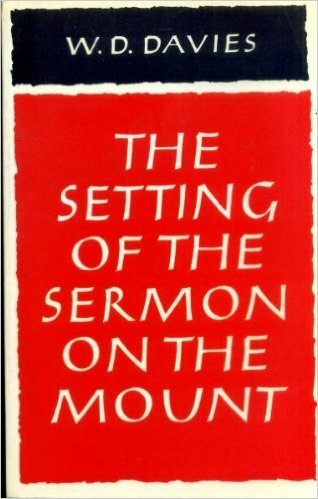 For this week’s giveaway, I have a paperback copy of W. D. Davies, The Setting of the Sermon on the Mount (Cambridge, 1963). W. D. Davies is a scholar everyone should read. I read his Paul and Rabbinic Judaism in Bible College; it set the stage for Sanders’ Paul and Palestinian Judaism and the so-called New Perspective. His commentary on Matthew in the ICC series (with Dale Allison) is a standard. This book on the Sermon on the Mount book is older, but something of a classic. At well over 500 pages, this is a serious study of the Sermon and one that raises questions Davies works on for the rest of his career. He explores New Exodus and New Moses motifs, Jewish Messianic Expectations, the setting/background of early Judaism, early Christianity and Jesus’ ministry. If this book is so good, why am I giving it away? I live in Grand Rapids, Michigan. You have no idea how good this town is for buying books for biblical studies. I recently bought this at Baker Books in their incredible used section, and when I went to put it on the shelf I realized I had a hardback copy already. Once again, but decaying memory is your gain, I decided I would give it away on Reading Acts rather than return it. Same rules as last week: Enter by leaving a comment answering this question: The Sermon on the Mount, Q or no Q? On Wednesday, September 16 I will randomly select one comment and ship the book out to the lucky winner. If you leave more than one comment, I will only count one comment per person for the contest. Not Q. No no no no no….not Q. My current thinking is…no Q, having read Dr. Goodacre’s volume on the subject, this is wear I’m at regarding Q.
Q, don’t even think about it! I deleted your address from your response Gordon. I think it is not a good idea to put your personal info like that in a public forum. Thanks for signing up! Probably not Q. Thanks so much for the book giveaway! No Q. But if Q, I wouldn’t be the least bit surprised. Q is a Star Trek character–only. Q, but only if “Q” is oral tradition.